The story of Axe stump is that it became wildly enraged when a lumberjack left his axe stuck in it. The anger made it much more powerful and speedy. Found in Perion. A gangster found near Savage Terminal's Black Market. A soldier found near Momijigaoka, Hayato and Kanna's starting area. A monster found in the Northern outskirts of Pantheon. The charred version of the Axe Stump. Found in Perion. A garbage box found near Edelstein. A creature found in the Sandstorm Zone of Verdel, a desert planet where Ark ends up after losing his memories. A monster found in the Southern outskirts of Pantheon. A stronger version of Curse Eye that must be killed for a quest in Ellinia. A vicious creature found in the dark forest of Arboren, Beast Tamer's hometown. A stump with the same speed as all the other stumps. Appears stretched due to its gaping mouth. These stumps also have a sprout growing out of them, adding to their distinctive appearance. They still follow the same concept, defeat them like you do all other stumps. Found in Perion with Stumpy. A barrel of toxic waste found in the treatment plant near Savage Terminal's Garbage Dump. An ore monster found in one of the training rooms in the Crystal Academy of Sanctuary, where the Verdant Flora reside until it is ravaged by Darmoor. It is based on a crystal of the same name. A Ghost Stump with an awkward expression. Aran have to fight these on request of the Cygnus instructor in Perion. Found in Perion with Stumpy. A monster found in the Eastern outskirts of Pantheon. Eurenth the old man in Heliseum's Forest has one of these as a pet. A stronger version of Cold Eye that must be killed for a quest in Ellinia. A walking streetlight found near Edelstein. A monster used for training Dual Blades. The "king of all stumps." 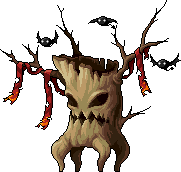 It was once a spirit of the forest, but as humans cut down the trees around it, its anger grew until the rage transformed it into the evil spirit known as Stumpy. It's responsible for the drying of Perion because it lives off everything living in the area. This boss spawns at North Rocky Mountain: Gusty Peak. It can fire a bat-shaped projectile as a ranged attack and jump to inflict minor earthquake style damage. It can also heal itself and the surrounding Ghost Stumps for 800 damage at a time. When it dies, it leaves a flurry of firewood, seedlings, leaves, and branches. Must be defeated for the quest Dances with Andras!. It can use an attack that can stun the player and can increase its power. Must be defeated for the quest The Final Battle with Amdusias. It can use an attack that can inflict blind on the player. Must be defeated for the quest Treasure, and Crocell the Demon. It can use an attack that may stun the player and heal itself and nearby allies by 500. Must be defeated for the quest Marbas the Demon!. It can use an attack that may inflict seal on the player. Must be defeated for the quest Catch Valefor!. It can use an attack that may stun the player. A very disgusting looking yellow lizard. They often swarm. Found in Ellinia. A barrel of flaming waste found in the treatment plant near Savage Terminal's Garbage Dump. A sentient helmet found in the Desert Cavern of Verdel, a desert planet where Ark ends up after losing his memories. Ark soon remembers that these helmets were worn by a race of creatures that were massacred by Darmoor's army. A weaker version of a Magician Specter, one of Darmoor's minions. Instead of working for Magnus, these are working for Albaire, a former friend of Ark's who is now a high-ranking general in Darmoor's army. Found east of the Ravaged Base in Verdel, a desert planet where Ark ends up after losing his memories. A stronger version of Surgeon Eye that must be killed for a quest in Ellinia. Another one-eyed lizard found in the trees north of Ellinia. A minion of Magnus found in a hideout in the Eastern outskirts of Pantheon. The second most powerful Evil Eye form that resides within Ellinia. Resistant to ice attacks but weak to fire. Handle with caution. Found at the beginning of the Road to the Mine near Edelstein. A sentient suit found in the Desert Cavern of Verdel, a desert planet where Ark ends up after losing his memories. Ark soon remembers that these suits were worn by a race of creatures that were massacred by Darmoor's army. A weaker version of a Warrior Specter, one of Darmoor's minions. Instead of working for Magnus, these are working for Albaire, a former friend of Ark's who is now a high-ranking general in Darmoor's army. Found east of the Ravaged Base in Verdel, a desert planet where Ark ends up after losing his memories. Involved in a quest for Hayato. A tiger responsible for the kidnapping of Moonbeam. Shade must defeat these for a quest. A tiger responsible for the kidnapping of Moonbeam. Shade must defeat this for a quest. The strongest Evil Eye form that lives at the far ends of Ellinia's Northern Forest near its weaker brothers. A barrel of scrap iron waste found in the treatment plant near Savage Terminal's Garbage Dump. A weak monster found near the Midsummer Night's Forest in the Ellinel Fairy Academy area. A stray dog found in the alleys near Savage Terminal's Brawl 'n' Bash Club. 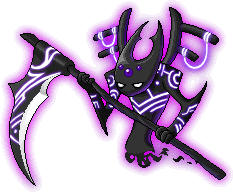 A weaker version of a Reaper Specter, one of Darmoor's minions. Instead of working for Magnus, these are working for Albaire, a former friend of Ark's who is now a high-ranking general in Darmoor's army. Found east of the Ravaged Base in Verdel, a desert planet where Ark ends up after losing his memories. A strange masked soldier working for Albaire, a former friend of Ark's who is now a high-ranking general in Darmoor's army. Found west of the Ravaged Base in Verdel, a desert planet where Ark ends up after losing his memories. Must be defeated for Dual Blade's advancement to Blade Acolyte. Found in Amoria Party Quest. Surprisingly, it is weaker than its smaller counterpart. Must be defeated to complete the 2nd job advancement on a Demon. This monster is actually Mastema, Demon's companion. An evil wizard named Francis who has been seen lurking all over Victoria Island over the course of Cygnus Knights and Aran training quests. Must be defeated as part of a quest assigned to Knights and Aran just before their second job. Aran have to defeat him multiple times in multiple quests primarily for unlocking skills. Located in Perion, in a secret cave. The password for entering his room is Francis is a genius Puppeteer!. His main attack involves launching a magic spell through his puppet, this attack is weak but quick. He can seal, use Seduce, and heal himself for about 700 HP so don't take him too lightly. Must be killed to complete the 2nd job advancement on a Blaster, Wild Hunter, Mechanic, or Battle Mage. Xenon's rival, who is trying to bring him back to Gelimer. You must defeat her while still in Pantheon. The boss of the Kobolds. Found in the furthest reaches of the dark forest of Arboren, Beast Tamer's hometown. This page was last edited on 9 March 2019, at 22:26. This page has been accessed 408,328 times.